And so in order for the main theme of this letter to have true meaning, I feel it necessary to briefly rehash all my criticism. Trust me. It will make the ending of this letter that much nicer. First, though, an olive branch. 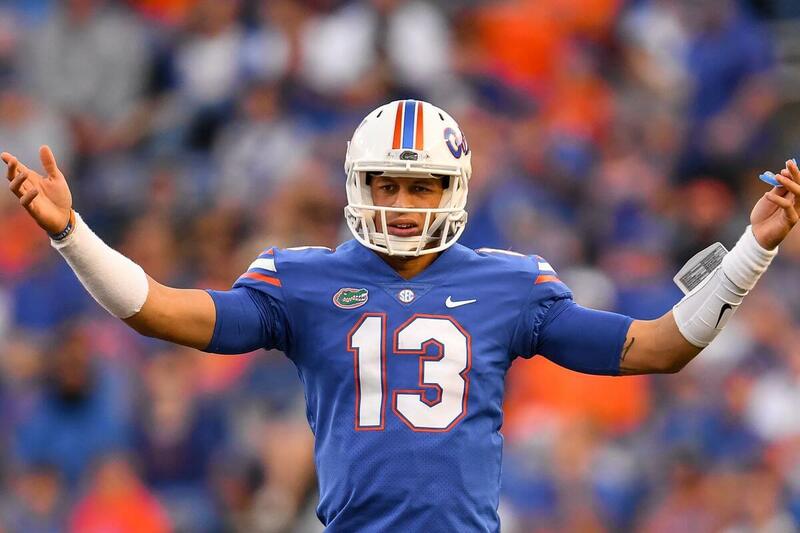 Playing quarterback for the Florida Gators is among the most heavily scrutinized tasks in sports. It lies somewhere in between playing shortstop for the Yankees and being the center on whatever team LeBron James is playing for. I am well aware of how difficult the pressure is to handle. You go through practice like everybody else, batter and bruise your body, grow mentally exhausted from in depth film sessions and the works, but then there’s the added pressure to perform that other positions don’t quite experience. When guys like Danny Wuerffel, Rex Grossman, Chris Leak and Tim Tebow set the standard so high, it’s nearly impossible to make everybody happy with your play. I get that. I do. It’s a job that only a select few are truly capable of handling, let alone mastering. However, while it makes this more understandable, it doesn’t change the fact that you’ve struggled. You’ve missed reads. You’ve one hopped open receivers on the easiest of throws. You’ve made bad decisions. You’ve only recently- and at long last- appeared to understand that every ball doesn’t need to to be fired two billion miles per hour. You have, quite simply, been the source of quite a lot of inanimate objects being flung across living rooms in the houses of Gator fans. And what makes it all worse is that while you have improved, you’re making a lot of the same errors you made a year ago- a year that, by the way, came after you redshirted in 2016 because you weren’t ready to handle the position. The week before last, against Missouri, seemed to be the breaking point for a lot of fans. And when you got pulled in favor of Kyle Trask, it appeared as though your days as the starter in Gainesville were numbered. Then Trask broke his foot. And you were the guy. Many of us, myself included, were terrified. I was honestly convinced that Florida was destined to finish the year 7-5 after that happened, and was even more convinced when the Gators went down 14-0 against the Gamecocks. But then you reached deep inside, put in a great week of mental and physical preparation (I wasn’t in those practices, but, well, you must have) and you rallied the Gators back. You could have easily folded. You could have shut it down. Or you could have let frustration get the best of you and cloud your performance. But you didn’t. Were you Tom Brady? No. But you know what you were? You were the quarterback the Gators needed to win the game, an eye popping 180 from the Missouri game and a real testament of who you are. You were lowering your shoulder and powering through defenders on running plays even though that’s clearly not what you were recruited to do. You were leading the way as a blocker on several plays, clearing out defenders and earning the adoration of your teammates. You made most (not all, but enough) of the throws you had to make. And you were the emotional leader- much as we as the fans may or may not have liked it. That took some guts and internal will. Maybe it’s being the son of a courageous man who served our country. Maybe it’s being coached up by an actual coach for the first time in your life. Maybe it’s something none of us will ever know about. But whatever the source of your effort was against South Carolina, I’m impressed. To bounce back from THAT performance against Missouri and be the guy you were against Cocky- yeah, I’m truly impressed. Everyone who is able to look at things objectively and not let emotion totally cloud his or her judgment is. I will go to my grave believing that you were an extremely limited quarterback, because there’s the entire 2017 season and a large portion of the 2018 season’s worth of mental files that indicate so. And so I’m not going to pour out some sappy apology to you about how wrong I was, because those games happened and will always remain as part of history. The tape is the tape. The mistakes you made will never not have happened. All that you’ve ever done to this point is canon, and the truth is that there have been more negatives than positives. But having said that, your story has not yet been completed. I do not objectively believe you will start next year- again, sorry not sorry, that’s me just stating things how I see them- but there are still three games left in the season. Actually, forget that. There’s one game left in the season. It’s in a week and a half in Tallahassee. Screw Idaho and screw the bowl game. That game in the state’s capital has become our season. You have a chance to go down in history as the guy who ended a half decade of pure misery at the hands of our Thanksgiving rival. Whatever else you’ve done in your career, all the missed reads, all the quacking ducks you’ve flung into triple coverage, all the open receivers you’ve overshot by ten yards, etc. will all be forgiven. If you are the guy who ends the streak against that ugly brown and puke colored team to the northwest, you will be forever immortalized as the hero who righted the ship and helped the Gators take back the state. It’s up to you how you finish your story. But I want you to know that for all the boos you’ve heard, you have a chance lock up a special place in Gator history. And your most advisable path to doing so is by doing what you did against South Carolina. Don’t do too much, stay within yourself, and be that leader we saw last week. Trust me, Feleipe. If you play like Clark Kent and beat that Dora the Explorer backpack wearing, dismembered Gator head wielding, #DoSomething pleading, karate chopping band of cultural misfits, the fans that have booed and supported you alike will come together and view you as Superman. And I assure you that for all I’ve said to criticize your play throughout your career, I’m rooting for you. One of your harshest critics. Bravo my good Sir, Bravo! Gator players Underage drinking is a huge problem that goes unchecked . Alcohol is a much bigger problem than pot on this team .